While ModernGraham supports the bottom-up approach to investing, many investors do utilize the top-down method, whereby an industry is selected before the company itself. With that in mind, this article will take a brief look at the best value stocks of the Financial Services industry, selecting the five most promising investment opportunities within the industry, and giving a broad look into the industry as a whole. 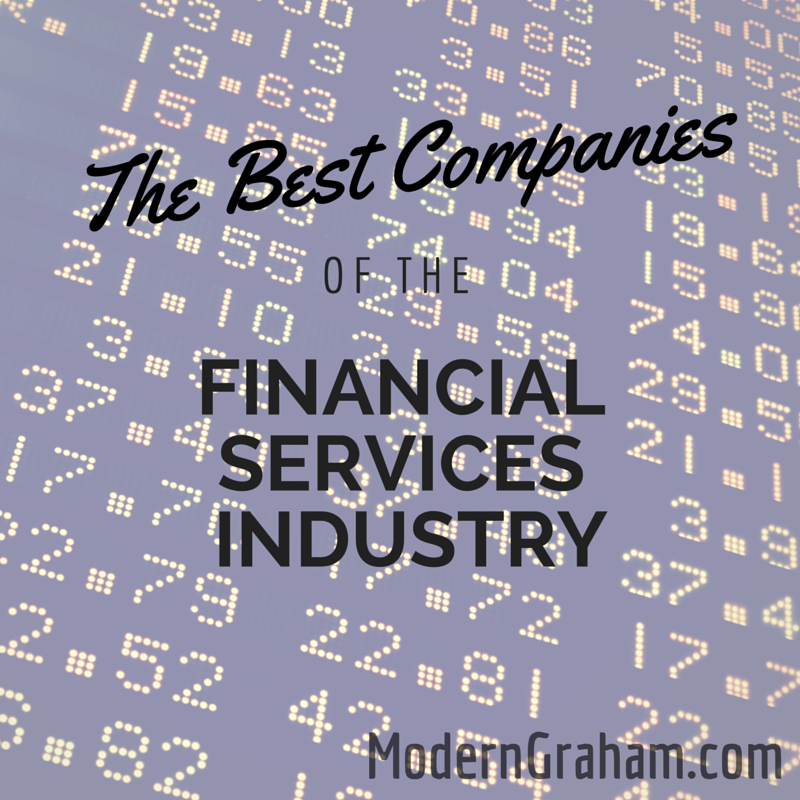 Out of the more than 550 companies reviewed by ModernGraham, 32 were identified as being closely related to the financial services industry. Of those, only five are suitable for the Defensive Investor, nine are suitable for the Enterprising Investor, and the remaining eighteen are considered speculative at this time. Excluding any extreme outliers, the average company was rated as being priced at 109.37% to its MG Value (estimated intrinsic value), with an average PEmg ratio of 23.20. The industry as a whole, therefore would appear to be overvalued, particularly in comparison to the market (see Mr. Market’s Mental State). American Express passes the initial requirements of the Enterprising Investor but not the Defensive Investor. In fact, the company passes every requirement of the Enterprising Investor types, but the Defensive Investor is concerned by the high PB ratio. As a result, all Enterprising Investors should feel very comfortable proceeding to the next part of the analysis, which is a determination of the company’s intrinsic value. When it comes to that valuation, it is critical to consider the company’s earnings history. In this case, it has grown its EPSmg (normalized earnings) from $3.11 in 2011 to an estimated $4.99 for 2015. This is a fairly strong level of demonstrated growth, and outpaces the market’s implied estimate for annual earnings growth of 3.43% over the next 7-10 years. Franklin Resources Inc. qualifies for both the Defensive Investor and the Enterprising Investor. The company passes all of the requirements of both investor types, a rare accomplishment indicative of the company’s strong fundamentals. As a result, all value investors following the ModernGraham approach based on Benjamin Graham’s methods should feel comfortable proceeding with further research into the company. Bank of New York Mellon passes the initial requirements of the Enterprising Investor but not the Defensive Investor. In fact, the company passes every requirement of the Enterprising Investor types, but the Defensive Investor is concerned by the lack of earnings stability and insufficient earnings growth over the last ten years. As a result, all Enterprising Investors should feel very comfortable proceeding to the next part of the analysis, which is a determination of the company’s intrinsic value. When it comes to that valuation, it is critical to consider the company’s earnings history. In this case, it has grown its EPSmg (normalized earnings) from $1.30 in 2011 to an estimated $2.14 for 2015. This is a fairly strong level of demonstrated growth, and outpaces the market’s implied estimate for annual earnings growth of only 5.72% over the next 7-10 years. BlackRock Inc. passes the initial requirements of both the Defensive Investor and the Enterprising Investor. The Defensive Investor has no initial concerns, while the Enterprising Investor is only concerned by the level of debt relative to the net current assets. As a result, all value investors should feel very comfortable proceeding to the next part of the analysis, which is a determination of the company’s intrinsic value. When it comes to that valuation, it is critical to consider the company’s earnings history. In this case, it has grown its EPSmg (normalized earnings) from $9.43 in 2011 to an estimated $17.67 for 2015. This is a fairly strong level of demonstrated growth and outpaces the market’s implied estimate for annual earnings growth of 5.38% over the next 7-10 years. Invesco Limited qualifies for both the Defensive Investor and the Enterprising Investor. The Defensive Investor is only concerned with the low current ratio. The Enterprising Investor has concerns with the level of debt relative to the current assets, but is willing to overlook those issues since the company meets the more conservative Defensive Investor’s requirements. As a result, all value investors following the ModernGraham approach based on Benjamin Graham’s methods should feel comfortable proceeding with the evaluation. KKR & Co. LP qualifies for the Enterprising Investor but not the Defensive Investor. The Defensive Investor is concerned by the short history as a publicly traded company, while the company passes all of the Enterprising Investor’s requirements. As a result, Enterprising Investors following the ModernGraham approach based on Benjamin Graham’s methods should feel comfortable proceeding with further research into the company and comparing it to other opportunities. Legg Mason Inc. (LM) qualifies for the Enterprising Investor but not the more conservative Defensive Investor. The Defensive Investor is concerned with the insufficient earnings stability or growth over the last ten years and the high PEmg ratio. The Enterprising Investor is only initially concerned by the lack of earnings stability over the last five years. As a result, all Enterprising Investors following the ModernGraham approach based on Benjamin Graham’s methods should feel comfortable proceeding with further research into the company. Lincoln National Corporation qualifies for the Enterprising Investor but not the more conservative Defensive Investor. The Defensive Investor is concerned with the insufficient earnings stability over the last ten years, while the Enterprising Investor has no initial concerns. As a result, all value investors following the ModernGraham approach based on Benjamin Graham’s methods should feel comfortable proceeding with the next stage of the analysis. Moody’s Corporation is suitable for the Enterprising Investor but not the more conservative Defensive Investor. The Defensive Investor is concerned by the high PEmg and PB ratios, while the Enterprising Investor is only concerned with the level of debt relative to the net current assets. Therefore, all Enterprising Investors should feel very comfortable proceeding with the next stage of the analysis, which is a determination of an estimate of intrinsic value. From a valuation side of things, the company has grown its EPSmg (normalized earnings) from $2.16 in 2011 to an estimated $4.04 for 2015. This level of demonstrated growth is in line with the market’s implied estimate for earnings growth of 9.07% over the next 7-10 years. T.Rowe Price performs well in the ModernGraham model and is suitable for both Defensive Investors and Enterprising Investors. The Defensive Investor is only concerned with the high PB ratio, while the Enterprising Investor has no initial concerns. As a result, all value investors should feel very comfortable proceeding to the next part of the analysis, which is a determination of the company’s intrinsic value. When it comes to valuation, it is critical to consider the company’s earnings history. In this case, the company has grown its EPSmg (normalized earnings) from $2.38 in 2011 to an estimated $4.22 for 2015. This is a strong level of growth and is well above the market’s implied estimate of only 4.99% annual earnings growth over the next 7-10 years.